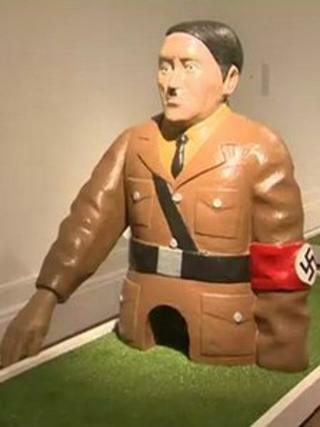 Art work in a Lancashire gallery depicting Adolf Hitler as a crazy golf ornament is "tasteless", a British Jewish organisation has said. The Jake and Dinos Chapman work is a statue of the Nazi dictator which salutes when a ball passes through it. The Board of Deputies of British Jews' Michael Samuels said the work, on display in Blackpool, had "absolutely no artistic value whatsoever". Gallery curator Stuart Tulloch said the work was a chance to "ridicule" Hitler. The Chapman brothers' art forms part of the Grundy Art Gallery's Adventureland Golf exhibition, which features art works as holes on a crazy golf course. Other holes depict an animated statue of Iraqi dictator Saddam Hussein, a boarded-up library and a desert island. The gallery described it as placing "the powerful image of the Nazi regime within the context of holiday fun and in doing so making reference to the British wartime spirit of making humour at the Fuhrer's expense". Mr Samuels said he did not know how depicting Hitler had "anything to do with Blackpool or with art". "He's not somebody that you would make a joke of - Hitler was responsible for the murders of many millions of people," he said. "I am appalled that the gallery would stoop to show an item like this which, in my opinion, has got absolutely no artistic value whatsoever. "If I were the gallery, I would give it back to the artists and tell them to keep it in the shed." Mr Tulloch said the art work's inclusion in the exhibition allowed the examination of the issue around it. He said Hitler had been defeated and the statue "gives us the chance now to ridicule him". He added that visitors to the exhibition had "taken it in the spirit that it is intended".